Testing RCD seals to collect leakage data - Kalsi Engineering, Inc.
As described in previous blogs, Kalsi Engineering has a 10.50” fixture for testing full scale RCD seals. This helps to avoid scaling issues that may occur when testing on smaller fixtures. For example, the thermal mass and conductivity of our 10.50” fixture is similar to an RCD mandrel, which allows more realistic testing, compared to reduced scale tests on 2.75” test fixtures. One important attribute of Kalsi-brand RCD seals is their ability to hydroplane on a thin film of lubricant, which reduces seal-generated heat and wear. This hydroplaning action produces an associated hydrodynamic pumping-related lubricant leak rate that must be taken into account when designing an RCD. The leak rate is influenced by lubricant viscosity, which is a function of temperature. An RCD uses two Kalsi Seals, each facing unique challenges. A partitioning seal partitions a pressurized seal lubricant from the drilling fluid, and a pressure-retaining seal retains the seal lubricant. The pressure of the seal lubricant is typically several hundred psi greater than the pressure of the drilling fluid. Our RCD seal test fixture was primarily designed to test pressure-retaining seals, but it can also be used to document the hydrodynamic pumping-related leakage of partitioning seals. Although RCD seals with a high hydrodynamic pumping rate are more durable than those with a lower pumping rate, not all RCDs can tolerate high leakage. The total pumping rate that has to be accommodated by the RCD consists of the combined pumping rate of the pressure retaining seal and the partitioning seal. We use our test fixture to obtain leak rate data for both types of service conditions. In our most recent test, we tested PN 381-35-11 RCD seals at 100 rpm using a range of differential pressure that might be encountered by a partitioning seal—300 to 500 psi. The 0.020” radial extrusion gap clearance between the mandrel and the seal carrier was also selected to simulate the service conditions of a partitioning seal. The mandrel had 0.007” of runout at the upper seal, and 0.003” at the lower seal (FIM). The test was conducted with a synthetic hydrocarbon lubricant having a 320 ISO viscosity grade. In an actual RCD, the lower end of the mandrel is flooded with circulating drilling fluid, which may be at elevated temperature. To simulate the cooling provided by that drilling fluid circulation, we slowly circulated a coolant just outboard of the test seals. Our objective was to establish a bounding leak rate for our customers to use to account for the leakage of the partitioning seal when designing their RCD. Because the hydrodynamic pumping-related leak rate increases as temperature decreases, we wanted to perform our test at a modest operating temperature. The test was specifically designed to be a leak rate test, rather than a durability test or an abrasive exclusion test. The first segment of the test lasted 32 hours and was performed at 300 psi. The circulating coolant temperature just outboard of the rotary seals was 108°F, and the bulk lubricant temperature between the rotary seals was 140°F. The combined leak rate for the two seals was 0.33 ml/hour. The second segment of the test lasted 83 hours and was performed at 500 psi. 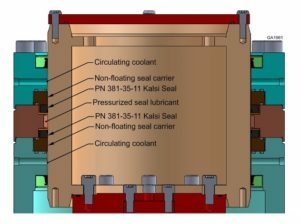 The circulating coolant temperature just outboard of the rotary seals was 111°F, and the bulk lubricant temperature between the rotary seals was 148°F. The combined leak rate for the two seals was 0.25 ml/hour. The seals were in excellent condition at the conclusion of the test. The test provides insight regarding the leak rate of this type of seal at 100 rpm and a particular temperature, and over a pressure range that a partitioning seal may be subjected to. Leak rate also increases with rotary speed. At the present state of the art in RCD seal design, seals with higher hydrodynamic pumping related leakage have better interfacial lubrication, which helps to prevent seal overheating. This facilitates higher pressure capacity, better abrasion resistance, higher speed operation, and longer seal life. Efficient lubrication also allows for a wider dynamic lip width, providing more sacrificial material to accommodate axially acting damage mechanisms, such as extrusion damage and abrasive wear. The PN 381-35-11 seal that was tested employs zig-zag shaped hydrodynamic waves, which have a very modest leak rate. With this general type of seal, higher speed operation may require circulation of the RCD bearing lubricant to cool the rotary seals.